This photograph of Harry Houdini, held by the State Library of Victoria, appeared in The Australasian on 19 February 1910. 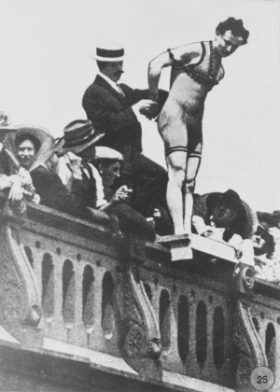 Houdini (or Ehrich Weisz as he was known to his mother) was about to jump, handcuffed, into the Yarra River in Melbourne off Queen’s Bridge. A month later, his aeronautical exploits were being reported in the Sydney Morning Herald (22 March 1910). His claim to be the first successful aviator in Australia was later challenged. This item at the Powerhouse Museum in Sydney is a starting point to the discussion and mentions a short flight by Colin Defries on 9 December 1909 which went unrecognised at the time. Harry didn’t stop there. 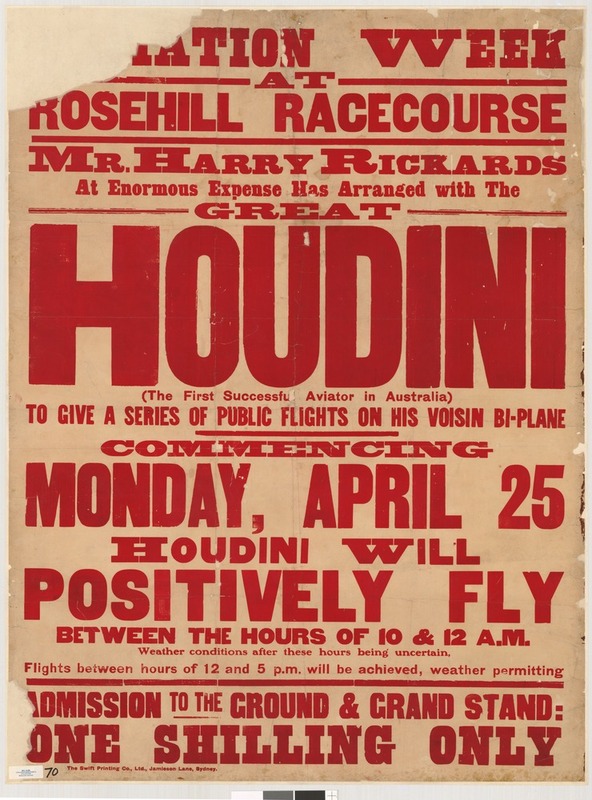 This poster, again from the State Library of Victoria, showed that Houdini’s capacity for self-promotion was equal to his escapology and aviation exploits. From the Sydney Morning Herald again on 2 May 1910. 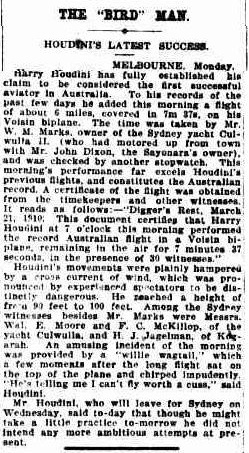 Houdini made a record flight in his aeroplane at Rosehill Park Racecourse yesterday. A crowd of several hundreds had gathered, and shortly after half-past 12 they were rewarded for their patience with the sight of the weird-looking machine circling gracefully round the track at a height of nearly 160ft. Houdini made a successful start, and his plane, driven by the powerful 60-80-h.p. E.N.V. motor, leaped to a height of about 20ft. It then dipped, and rushed towards the ground at a rate bordering on 40 miles an hour. The public gasped, while a number of women screamed, for it seemed as if the aviator were rushing to certain destruction. A neat turn of the lever controlling the planes, however, altered its direction to a nicety, and the machine soared gracefully skyward, until an altitude of 150ft was reached. But his difficulties were not over. The machine rose until at a height of 200ft it turned and met the wind full in the face. It quivered, and fell swiftly towards the ground, as the engines had stopped. It looked as if Houdini’s last moment had come. The crowd was dumbfounded, but when only a few feet from the ground the plucky aviator managed to start his engine again, and the plane rose once more. Houdini then circled round the race track twice, finishing up by sailing over the grand stand and dropping easily to the ground on the opposite side. It was a splendid flight. A better demonstration of modern aeronautics could not have been provided, and the public cheered heartily, many rushing to seize Houdini by the hand when he reached the earth. “That’s my fourteenth fly in Australia,” Houdini mentioned as he landed, “and I am satisfied.” He was carried shoulder high by the excited crowd. The machine, which was practically uninjured, excepting a slightly bent tube, is now to be dismantled, as Houdini is taking it with him to America. Beautiful and well documented article about Houdini, The Great Master Magician ! !